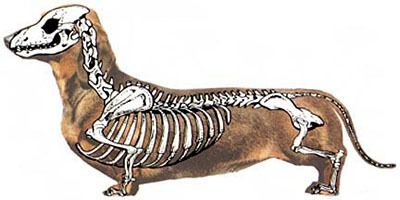 Why do some Dachshunds have Back Problems? The Dachshund ‘bad back problems’ scenario that people often refer to is actually a disorder called IVDD or inter-vertebral disk disease. This disease is common in dogs, but Dachshunds are especially vulnerable not because they have a long back, but because of their short legs. Well, actually, it’s the gene that causes their legs to be short and is responsible for their dwarfism. This gene is called chondrodystorphy. It gives the Dachshund a predisposition to disk problems in their back. In between each vertebra in the spine are the inter-vertebral disks. These disks are gel-like on the inside and have a tough outer shell. These gel-like disks act as cushions or shock absorbers for the Dachshund spine and back. These disks work well cushioning forces that go straight up and down the back and spine. 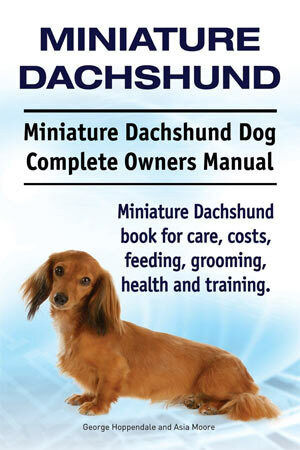 The disks do not work as well with diagonal or twisting motions in the Dachshund’s back. For this reason, things that other dogs can do with relative ease, such as jump from the couch, run down stairs or navigate a sharp turn, may produce back injury for a Dachshund. The dwarfism gene, chondrodystrophy, causes the gel to become calcified (hardened), typically beginning after age 3. When this happens, the disks lose their suppleness or elasticity. This causes the Dachshund to become more prone to back injury of the spine. Will My Dachshund Develop IVDD? About 25% of all Dachshunds will develop IVDD to some extent in their lifetime. Most Dachshunds will never rupture a disk. An episode of IVDD does not necessarily mean paralysis. Some cases are minor where physical therapy or ‘crate’ rest will lead to recovery. One of the most important factors in an episode of IVDD is immediate treatment. If you suspect your Dachshund has IVDD or back injury, take him to the vet immediately! Just my humble pnioion. 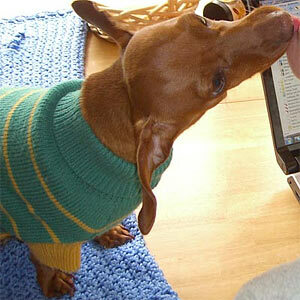 I think Doxies prefer having their humans around all day. I’m lucky there because I no longer work.I personally have never done this but an old dog owners trick is that if you have to leave your dog with somebody else for a time you leave an item with them that has your scent on it.When I was a kid there was this young man who owned a German Shepherd. He was drafted into the army and had to go to Vietnam. He left the dog with a friend but he also left one of his shirts that he wore frequently there with the dog. The people who were keeping the dog had no trouble with him trying to run off and go home. The fellow survived Nam and had a happy reunion with his dog.If I ever have to leave mine anywhere like he did I will do the same thing. Are the back problems a result of inbreeding?